Today's chat with Mariano Tufró covers many topics, including the aspects of global leadership development he addresses, working in virtual teams in a matrix environment and making the shift from corporate work to setting up Leadership Minds. 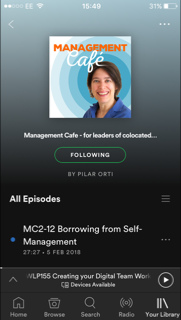 09:30 Mariano talks about Agility, Mindfulness, Global Teams and Connectivity as four crucial aspects of modern leadership development. 14:20 Reassesing leadership development in the context of global teams. "The fact that companies are global doesn't mean that leaders know how to act globally." 17:55 "Trust your local talent". 20:40 Mariano talks about his own practice in leadership development. 27:00 Positional authority versus respect. 38:00 Making the move from the corporate world to setting up on your own. Suddenly you're confronted with your own limitations. Today’s episode consists of a detailed chat with Mariano Tufro about leading global teams, to start with, but we also talk about his own approach to leadership development, which he is now offering to organisations through his company, Leadership Minds, (leadershipminds.co.uk), he also talks candidly about ethnocentricity and how we tend to think that our own cultures are better than others and how this can have an impact in how we recruit or not, local talent when businesses operate globally. Towards the end of our chat, Mariano also shares his own experience of moving from corporate life, to setting up on his own, so if you have just made that move, or are thinking of making it, then do stick around. Throughout the conversation, Mariano touches on the concept of building an online reputation, not from the point of view of engaging with the outside world and potential clients, or customers, but from the point of view of building a reputation within your organisation. And when I was editing this interview I thought, ah, this is probably a good moment to recommend an episode of the Collaboration Superpowers podcast, that LIsette, my co-host every other week, runs – and this is a conversation she has with Luis Suarez, which is all about moving the conversation away from email and onto a more open space. So do check it out if it sounds like something you’re interested in head over to the Collaboration Superpowers website or look for episode 21. And talking of online content worth sharing, the other day, while looking for something to watch while I was having lunch at the Hub – and yes, I know it’s not great to have lunch at your desk but I was only there for a few hours and quite fancied eating a sandwich and watching something inspirational – and just as an aside, Impact Hub is a co-working space which has a global network and I’m based in King’s Cross in London – so, I came across a wonderful ted talk by Ricardo Semler. I first came across Semler some time ago, when I read his book Maverick, where he tells the story of how he took over the family business, Semco and introduced a whole range of revolutionary practices like employees determining their own salaries or being involved in the decision to hire their managers. So I saw this TED talk, only from October 2014 and I had a look. It was wonderful. It’s called How to run a company with (almost) no rules. But the talk goes beyond that. Yes, he does talk a bit about some of the things that make his company unique and has some great quotes about the need to revisit the way we look at work. But the real value of this talk in my opinion is how he talks about redesigning and rethinking about the education system. He talks about how they’re structuring the curriculum in I think it was two of the schools he’s set up in Brazil, and I’m thinking, wow, can you please talk to the government in the UK now? Here’s a guy who’s really thinking about the best ways of adapting the education system to the 21st Century, and it’s got nothing to do with technology, while in the UK we seem to be gravitating towards a more traditional form of learning. But as a quick example, he talks about how to make the curriculum more exciting and relevant and instead of saying ok, now you have to learn maths, now you have to learn physics, how the subjects can be packaged in much more interesting ways like a 45 day course on building a bike. “Try,” he says,” building a bicycle without understanding Pi.” Creative thinking. If we want to change how we work, we have to address how we learn, not just as adults (and that is something that Mariano brings to this podcast, how he creates learning spaces for people, but if we want to change the world of work, we also have to think about how children are being educated and introduced to work, through school.